From 2 hour hikes to half day journeys, Feather will match the group’s or individual’s skill level. Most vortex hikes are from 3-4 hours to allow pick up and drop off. Spring water, organic snacks and backpacks are provided. 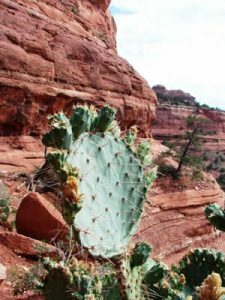 An easy hike through the upper desert or Oak Creek Canyon learning our native wild plants as foods and medicines. This hike journeys to one of the vortexes where a guided meditation is offered to realign one to their inner knowing and expanded awareness. 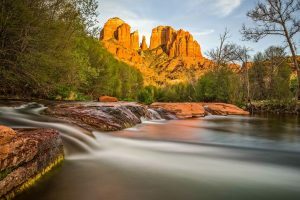 From the towering red rock formations to the crystal clear waters of Oak Creek Canyon, we will customize your hiking tour. You decide if you want an easy, moderate or more aerobic hike. Earth Ceremony, self healing and empowerment tools can be offered. 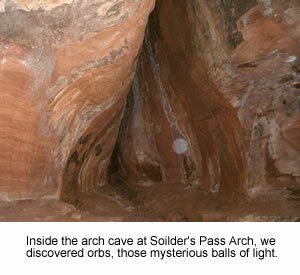 Sedona Vortexes are places on the land where the electromagnetic energy is strong and brought to the surface. They are intersections or follow lay lines of the earth’s meridians, or grid systems. Active, flowing, spiraling patterns of distinct healing force, subtle yet powerful. 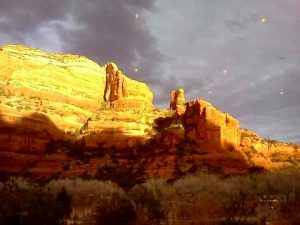 The Sedona Vortex can be activated within each individual who journeys to them through intention and for some, a bit of guidance. 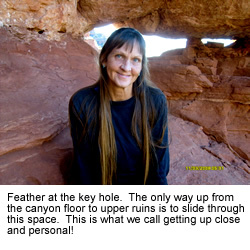 Feather Jones leads many Sedona vortex tourscustomized to the individual, couple or group energy requests. These on the land hiking adventures can be anywhere from 2 hours to half-day vortex tours. 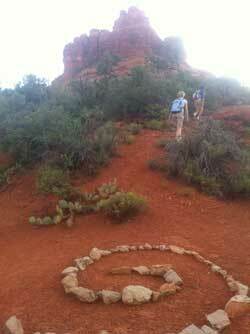 Each of the 5 vortexes in Sedona has a unique energy signature. Cathedral Rock vortex is the most popular with inspiring views. One can access their Angel or inner guides, view past lives, travel to the heart of the earth mother and open themselves to healing. This magnetic vortex grounds and supports an individual, strengthening the earth element. Bell Rock vortex is more electric in nature, showing one resolution to challenges and new ideas, expanding the awareness of higher dimensional energies. Working with the chakra systems, Bell Rock vortex activates the higher chakras finding clarity in one’s life path and gives the ability to intuitively alter and adjust any situation. Boynton Canyon vortex is wide and subtle and soft, grounding and uplifting both. One feels nourished and strengthened, recharged and aligned. The trees are alive with essence one can palpate. Airport Vortex is an easy hike and requires limited hiking skills yet is powerful in its pulsing resonance. Again, like Bell Rock vortex, it is electric carrying energies upwards and creating new ways to view old problems. New ideas and thoughts can flood the consciousness in those wanting this experience. Bear Wallow Canyon and Cow Pies vortex is an awesomely beautiful hike up a gentle path by a stream bed. With views that are phenomenal, one can step back or forward through time to access other time lines. Many dolphin dreams are accessed through this area. West Fork Canyon and Long Canyon are other incredible hikes in Sedona one can take and still feel the earth’s resonance in nature. Big trees, tight canyons with tall rock face walls along the creek beds with overhangs and grottos, slick rock ledges and hanging trellises of vines and flowering plants. Greens and reds dominate the landscape year round. 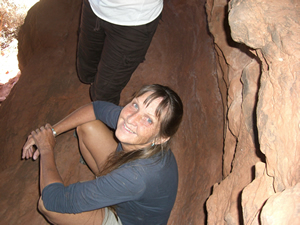 All of the Sedona vortex tours are lead by Feather Jones, who has been leading hiking tours and herb walks for 20 years. Let yourself experience the beauty of Sedona and walk the red rock trails with Feather.